We leave for Paris tomorrow and we have croissants on the brain! Paris is so many things, but anticipation of the city’s beautiful boulangeries, coupled with our love of Viennoiserie, has our tummies growling. Friends are hosting us in Paris and plan to introduce us to new and wonderful things. We hope to introduce them to some of our Paris favorites as well. This will be our second visit to both Paris and the Champagne region. On our first visit, we rented an apartment in Paris for ten days, using it as a jumping off point for visits to Versaille and Reims. We discovered, usually by accident, some fantastic little spots including one of our favorites, the cheeky Legay Choc. Thanks to a crazy Icelandic volcano, our April visit to Paris was unusually quiet with near-empty museums and barely crowded churches. This trip comes courtesy of a gala auction indulgence, entitling us to a week in a country home in Orbais L’Abbaye, a short drive from Chateau-Thierry. We’ve decided to visit in the fall so that we can take part in the local grape harvest or vendange. Champagne’s wine growers are in the midst of picking which should mean that the area will be bustling when we arrive. Here’s hoping our effort to learn a little French with Duolingo will be enough to get by with the people we meet! Our plan is to take a photographic journey through the countryside trying our darnedest to document the specifics of our experiences so that we can share them with you. And as if Paris and Champagne weren’t enough, we’re heading to Belgium afterward for a few days of tasting and touring. We thought that since Belgium is a short train ride away, we should visit the country famous for its excellence in all four of the major food groups – beer, chocolate, fries and mayo. We expect we’ll witness things like sunrises and sunsets that are so spectacular that a photograph will never be able to capture the magic of the moment. Food and drink will be the focus. Still, we’re going to give it our best shot. Instead of simply teasing you with thoughts of late mornings in lovely little Parisian cafes, noshing on buttery, flaky pain au chocolat and sipping cafe au lait, we’re sharing this David Leibowitz-inspired croissant, made from graham flour and a mix of butter and coconut oil. Hardly traditional, their rich, satisfyingly crunchy exterior and soft, yeasty center makes them irresistible nonetheless. Using coconut oil is a challenge. This recipe only works in cool weathered areas or in a well air-conditioned kitchen. If your kitchen is more than 75 degrees and you’re refrigerator is space-challenged, this could be an issue. Aside from that, working with laminated doughs is relatively easy if you follow a few basic rules. Graham flour is a somewhat unusual substitute for the flour typically used to create croissants. It has a rich, nutty taste. Think graham crackers. The flour is also extremely nutritious; high in both fiber and protein, magnesium and B6. The challenge in using graham flour in a croissant application is the large pieces of wheat germ it contains. Graham flour is a course flour which is generally not used when making laminated doughs because the germ’s sharp edges may cause little tears in the layers. But it is a healthy four and if you can live with smaller flakes and crunchy shards, you’ll love the flavors of the nutty flour and butter. While you’re at it, use some of the dough to make your own pain au chocolat or almond croissant. Your options for gilding the lilly are endless. 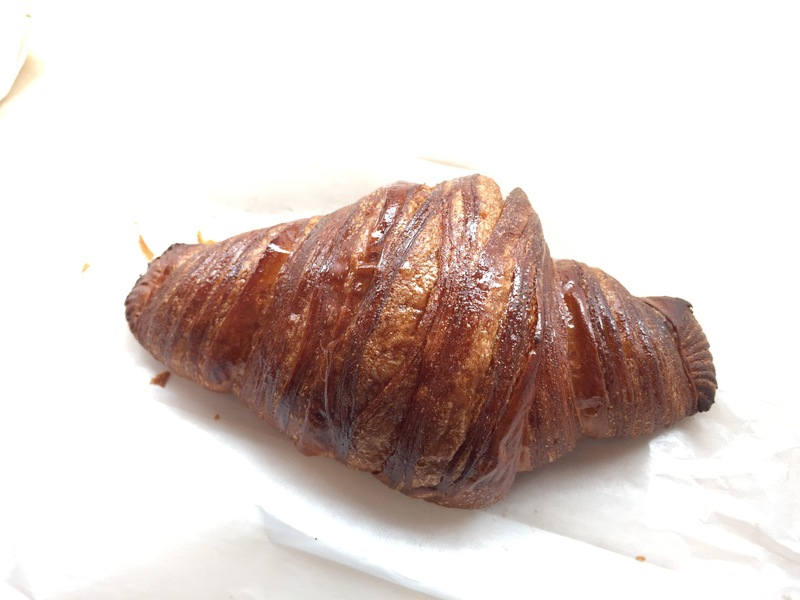 There will be future croissant installments as we share what we learn from our experimenting. In the meantime, don’t be shy and give these a try. If you can mix a yeasted bread dough, you can make a laminated dough. In a small bowl, mix the all-purpose and graham flours together. Mix the yeast with the milk and sugar in the bowl of a stand mixer, or stir it together in a large bowl. Stir in about one-third of the flour mixture and let the mixture stand until it starts to bubble, 10 to 15 minutes. Mix in the rest of the flour and the salt, and stir until all the ingredients are combined. Knead the dough on a lightly floured countertop a few times, just enough to bring it together into a cohesive ball. There’s no need to overknead. Put the dough in a bowl, cover with plastic wrap, and let the dough rest in the refrigerator overnight, or at least 6 hours. Put the cold butter and coconut oil in the bowl of a stand mixer with the paddle attachment and beat on medium-high speed until there are no lumps in the oil. (If you don’t have a stand mixer, mix the two together with a wooden spoon.) If the coconut oil is too soft put the mixture in the fridge. If too cold, zap for a few seconds in the microwave. Lay a piece of plastic wrap on the counter or in a square bowl and place the butter mixture in the middle. Enclose it and shape into a 4- by 4-inch square. Chill the butter for 20 to 30 minutes. Unwrap the chilled square of butter and place it in the center. Fold the flaps over the butter, sealing the dough around the butter completely, and whack the dough with a rolling pin to flatten it out. Roll the dough into a 12- by 9-inch (30 by 22cm) rectangle. Lift up one-third of the left side of the dough and fold it over the center. Then lift the right side of the dough over the center, to create a rectangle. Take the rolling pin and press down on the dough two times, making an X across it. Mark the dough with one dimple with your finger to remind you that you’ve made one “turn”, wrap it in plastic wrap, and chill the dough for 45 to 60 minutes. Do the next turn of the dough the same way, rolling and folding the dough again, making 2 dimples with your finger in the dough, then chill it for another 45 to 60 minutes. Do the last turn and folding of the dough and let it chill for an hour. If there are any large pieces of butter or coconut oil, remove from the dough. Line a baking sheet with parchment paper or a silicone baking mat. Unwrap the dough and roll it out on a lightly floured countertop until it’s a 15 x 9-inch rectangle. Trim the edges with a sharp chef’s knife and cut the dough into 4 rectangles, then cut each into 3 rectangles diagonally, making 6 triangles, or to make chocolate croissants, cut in half (see photo for process). Take one triangle and roll to lengthen it to 11 inches (28cm) long. Starting at the wide end, roll the croissant up toward the point, not too-tightly. Set it point-side-up on the baking sheet and roll the rest of the croissants the same way. There are two methods you can use. For chocolate croissants, cut rectangles in half and place a square of chocolate in the center. Fold over the sides and place the seam on the bottom of the croissants. To proof the croissants, cover the baking sheet with a large plastic bag (such as a clean trash bag), close it, and let the croissants proof in a warm place until the croissants are nearly doubled and puffed up, which will take 1 1/2 to 2 hours. To freeze the croissants before baking. Cover the baking sheet with plastic wrap before proofing and place the sheet pan in the freezer. Once the croissants are frozen, you can take them off the sheet pan and store in a large freezer bag. To bake the frozen croissants. Take them out of the freezer the night before and place on a baking sheet, cover the croissants with plastic wrap and place it in the fridge. The next morning if the croissants have not yet doubled in volume, keep covered with plastic and place the croissants in a warm place until doubled. Preheat the oven to 400ºF (200ºC.) Mix the egg with a pinch of salt and brush each croissant with the glaze. Bake the croissants for 5 minutes, then reduce the heat of the oven to 350ºF, and bake for 20 to 25 minutes, until browned. Some butter may seep out during baking, which is normal. Pastries occupy a special place in our relationship and in our hearts. When Jason and I first met, he was working at The Wild Flour Bakery in Ogden. We ate a lot of pastries in those early years (and I gained a little weight), thanks to the bakery’s leftovers. Needless to say, we expect a lot from pastries. Our usual haunts – Tartine, Knead Patisserie and B. Patisserie – never disappoint. When we try a new spot, these are the standards against which all others are judged. Croissants in Paris? Sure, they’re OK, but we’ve never eaten one that compares to the perfection that is a Tartine croissant. Kuin Amman at Dominique Ansel in NYC? Yeah, they’re pretty good. We admit it. But we’re a little judge-y when it comes to these things and that means we’re reluctant to spend those precious calories gambling on an unknown (to us) baker. Knowing we were likely too late to get our hands on the “croissant muffin” or “cruffin” at Mr. Holmes Bakehouse, we decided to check the bakery out anyway (cruffins come out at 9AM and sell out quickly). 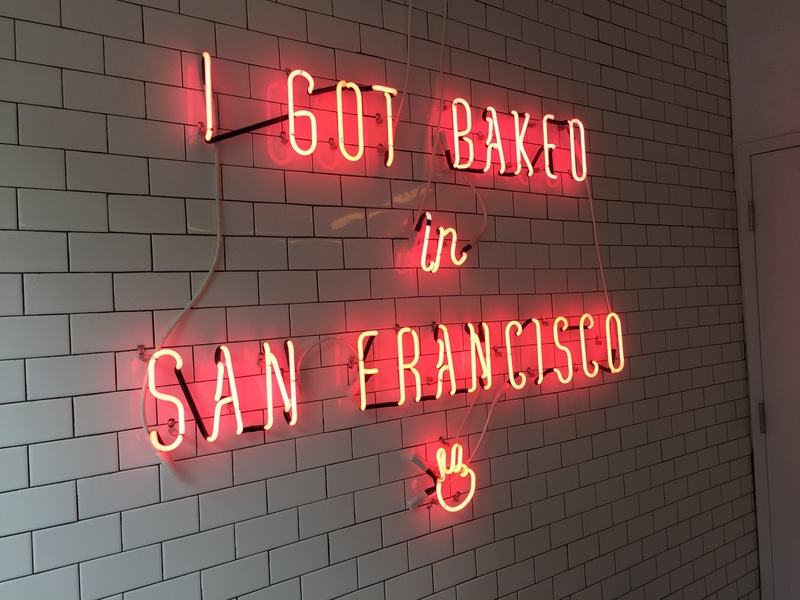 The bakery is a small, kitschy little spot in San Francisco’s Tenderloin that is wildly popular in spite of the crappy neighborhood that houses it. In this city, that means they offer something people want. 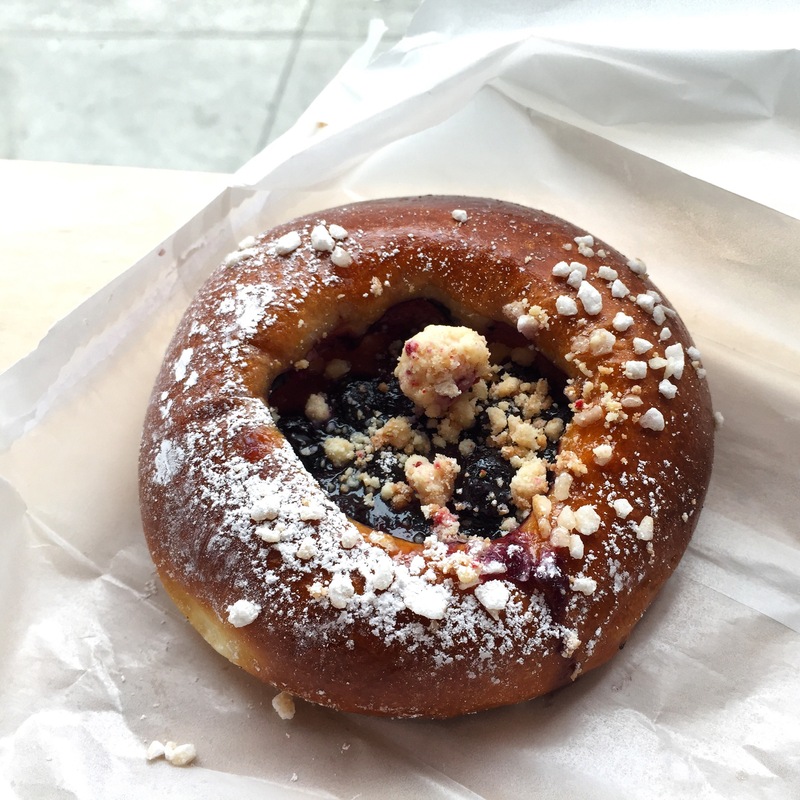 We tried the blueberry “Brioche Bomb” and a croissant. The brioche was soft and pillowy. Crunchy sugar crystals and a tasty crumb topping added nice texture. The blueberry filling was sweet, but not too sweet. Worth the visit. We liked the croissant a lot. It had a nice dark crispy outer layer and lots of flavorful soft layers in a perfectly sized portion. It was far better than almost all of the croissants you’ll find in a grocery or a coffee shop. Worth returning for more. If you’re going, be sure to line up early for the signature cruffin. When they’re gone, they’re gone. They’re open daily from 7AM weekdays / 8AM weekends and close when they run out of goodies!